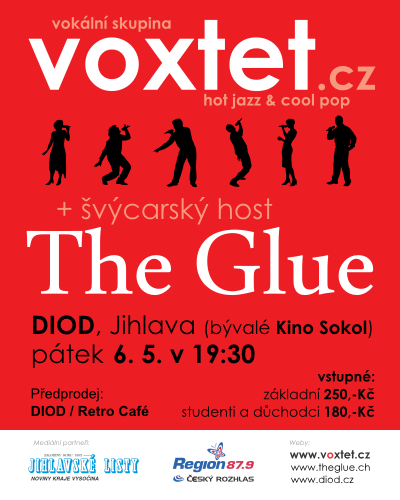 Voxtet uvítá na společném koncertě švýcarskou vokálním partičku The Glue. Na společné pódiu se setkají ve zbrusu novém prostoru DIOD - divadlo otevřených dveří. DIOD vznikl rekonstrukcí Kina Sokol a nabízí alternativní a velmi variabilní prostor k ostatním jihlavským divadelním scénám. For the past thirteen years the "band without instruments" has been enthusing their audience. What started off with appearances at birthdays and weddings has developed into a veritable second job over the years. The 5 young men have already produced four albums, a single and a DVD, all while having been on stage over six hundred times all over Europe as for example in Germany, France, Austria, Spain and the Czech Republic. Their specialty, next to their self written songs reflecting the entire width of the band's musical genres, is their unconventional performances. The Glue astounds no matter the setting. Notable highlights thus far have been being the only Swiss band at the renowned Vocal Total A Cappella Festival in Munich and Berlin, as Swiss support at the FIFA World Cup 2006 in Germany, being honored and performing live concerts on Swiss Radio DRS, perfoming as headliner at Switzerlands greatest openair Youth Festival and selling out concerts at the theater in Basel. The Glue are, at the moment, on the road throughout Switzerland, Germany, Czech Republic, Canada and USA performing their current program "Kin' de Lele", charming and enthusing crowds all over with their comical, unusual yet still always professional musical performance.